Applied in an enterprise, a sector of economic activity or the economy as a whole, productivity may be defined as an output and input relation. The term productivity can be used to asses or measure the extent to which a certain output can be extracted from a given input. This may appears simple enough in cases where both the output and the input are tangible and can be easily measured; however, in cases where intangibles are introduced measure of productivity can be more difficult. In the case of goods production, the objective is the manufacturing to a better cost, through the raw material, with productivity of the primary resources of production: Materials, human resources and machines. It's on these, where the action of industrial engineers should address their efforts. 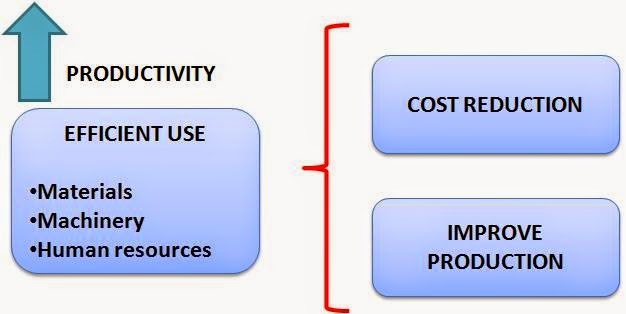 Increasing productivity indexes and reducing production costs, are fundamental tasks of an industrial engineer. nice blog !! i was looking for blogs related of Civil Engineering Instruments supplier . then i found this blog, this is really nice and interested to read. thanks to author for sharing this type of information. Thanks for the wonderful post about industrial engineering classes and its notes, you are really working hard to discover the things for real world peoples knowledge. Thanks, keep writing the wonderful post. Thank you very much for the good post about industrial engineering classes and its notes, you are really working hard to discover the things for real world peoples knowledge. Most of the time I don’t make comments on any post, but I'd like to say that this content is really helpful. Please share with us more post like this. This is really an important blog with many helpful information. I have been searching for a long time for this types of content. Keep up posting more and thanks for your great staff. Hi your blog reviews and comment is useful to us. Why u not upate about modular kitchen showrooms in chennai in your blog.